Amy asking Anne about her night with Bill. Anne smiling happily. Pinhead grilling Bill about his night with Anne. Bill brushes him off by saying it was average and ordinary. Anne overhearing. Sally inviting Drew for coffee. Sally inviting Drew to a movie. Sally barging in on Drew while he is changing his clothes. Karl and Joel find Anne in the ute at the side of a river bank. Karl and Joel pushing the car. The car going out of control and going into the water, trapping Joel's leg under it. 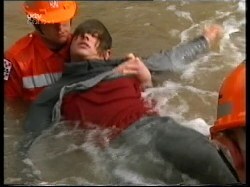 Joel in agony with the water rising. Karl sending Anne for help in the Thunderbird. Karl ripping piping from the ute for Joel to breathe through. Joel underwater breathing via the piping. Anne running back to the campsite hysterical to call for help. Karl holding Joel's breathing pipe and trying not to panic. 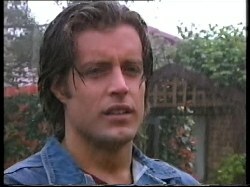 Sally is trying to seduce Drew but he says he can't because Joel is his mate and Sally has only just broken up with him. She is very insistent and kisses him, but Drew stops the kiss and tells her it isn't going to happen because of Joel. Sally asks Drew if there's someone else but he says there isn't, it's just really bad timing. She asks if they're still friends but he sends her off so he can get dressed! Anne has got through to the emergency services. Susan comes in under a waterproof and large umbrella. She asks if they've heard from Karl and says she has a weird feeling that something's not quite right. She laughs it off though. Phil suggest the Thunderbird might have broken down going on past experience(!). Drew escorts Sally to her car under an umbrella. For some reason when she's gone Drew doesn't bother to use the umbrella and just stands there in the rain! 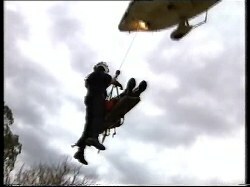 A helicopter flies overhead. Anne is wrapped in a blanket now. 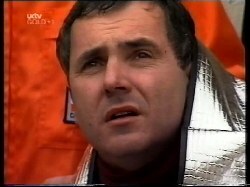 Phil has heard what's happened and is telling Susan that Joel is in hospital being treated for his leg and Anne for hypothermia. Joel is in a bed hooked up to a drip. The nurse tells him there is some damage to the ligaments of his knee. Joel looks worried – he's clearly thinking about his triathlon career. Karl comes in to see Joel. Susan then comes in too. Joel doesn't want to ring his mum because she'll only worry. Susan says she might read about it in the paper. Joel is worried that Dominator Sports will read about it too. Susan congratulates Karl on what he did for Joel. Anne is in hospital for a night for observation. Phil is visiting her. He asks Anne why she went off in the ute. She says it was nothing important, but Phil tells her she is a sensible girl and wouldn't usually drive unlicensed even in good weather. She says she will talk to him about it later. Bill comes in and Anne turns over in bed so her back is too him. Bill wants to know what he's done to upset her. Eventually Anne tells him that she overheard him talking to Pinhead. Bill tells her that he played it down to Pinhead to stop him going on about it. For Bill, the Tentluvin™ episode was private between him and Anne and was all about love and trust. Bill is a bit cross that Anne ran off at the first stumbling block. Anne starts to cry saying it's all her fault – she ran away, crashed the ute and almost killed Joel. Bill stops being cross and comforts her. Drew tells Sally about Joel's accident. He suggest that she go and see him the following day. Sally isn't too keen. Anne comes in to see Joel who has an oxygen mask on. He admits he is in a lot of pain. Anne apologises but Joel says grimly that it was just an accident. Sally comes in to see Joel. He is pleased to see her but she is a bit awkward. Joel asks her to stay for a while so they can chat. Phil is sorting out some paperwork for Anne regarding her inheriting Lily's house. Karl comes in to give Lance a checkup (he's still got glandular fever). Karl tells Phil that the Thunderbird has been towed to Lou's. Phil says it's at Lou's more than with him! Joel is telling Sally he was scared and it made him realise who the important people are in his life. Drew comes in and Sally decided to go. Joel kisses her goodbye. When she's gone he thanks Drew – whatever he said to Sally worked. Joel seems to be under the impression that Sally wants to work things out between them.